Few things improve a backyard's appearance like one of our beautifully crafted pergolas. 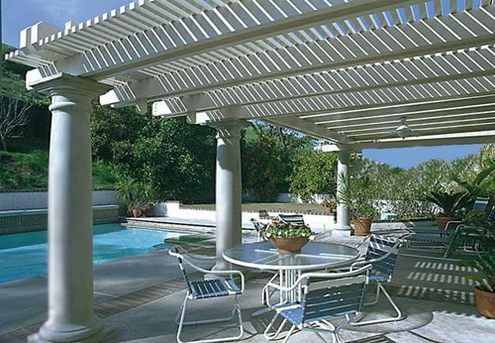 Our pergolas are built from long lasting aluminum and offer superiority, simplicity, and incredible beauty! Our pergolas are 100% maintenance free and are backed by a LIFETIME WARRANTY! DURABILITY: Wood is going to dry out, shrink, crack, splinter and split. Our aluminum will have none of these issues and will last for generations to come! MAINTENANCE: Wood will need painting or staining year after year while our aluminum is painted with Kynar 500, a mult-step coating system featuring an ultra-tough carbon-flouride bond that is roller applied and baked-on. We guarantee it will NEVER peel, flake, rust, or crack! DAMAGE: Wood is susceptible to termites and rot damage but not our aluminum! PRICES: Aluminum is a more affordable route than more traditional wood construction. Hathcock Home Services builds pergolas and arbors in Dothan, Ozark, Enterprise, and the surrounding southeast Alabama region. We also serve customers in parts of southwest Georgia and the northern Florida. Contact us for a free, in-home assessment.